Situated prominently atop Golden Hill in Bridgeport, Connecticut, the Cathedral Church of St. Augustine was consecrated in 1869 as St. Augustine Church, founded in 1842. Designed by Patrick C. Keely (1816-1896), America’s celebrated and most prolific church architect of the 19th century, its heroic stone tower and spire, completed in 1894, can be seen for miles and have served as a local landmark for more than one hundred years. According to The Bridgeport Standard, it was the largest church edifice in the state, seating 1500 souls. The Roman Catholic Diocese of Connecticut was divided into three parts in 1953. While the Archdiocese remained in Hartford, two new dioceses were formed in the cities of Norwich and Bridgeport. St. Augustine Church, being the first Roman Catholic parish in Fairfield County, was chosen to become the new Cathedral of the diocese. 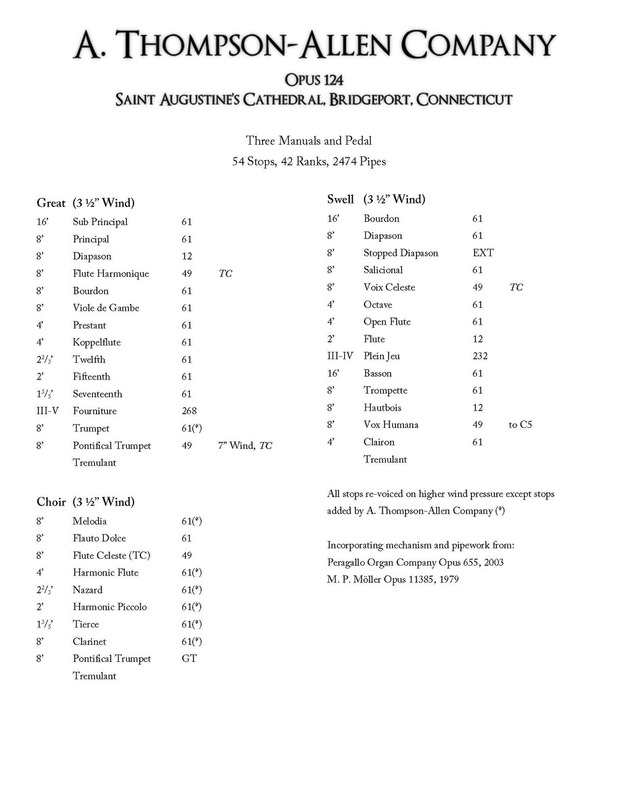 Little is known about the first organ in St. Augustine Church, but the celebrated Boston firm of Hook and Hastings installed a substantial three-manual organ of forty-one stops in 1884 as their Opus 1201. In 1906 this instrument was either altered or replaced by the Louis F. Mohr Company, and this organ was subsequently replaced in 1979 by M. P. Möller Organ Company’s Opus 11385. A modest three-manual instrument having 1,839 pipes, the Möller organ was divided between the rear gallery and the chancel, and it served reliably for more than twenty years. In 2003 a $4 million renovation of the building included an extensive rebuilding and enlargement of the Möller organ by the Peragallo Organ Company of Paterson, New Jersey. The instrument, named the Alma Schenk Hiendlmayr Memorial Organ, was the gift of Mr. Richard Hiendlmayr in memory of his first wife. The entire instrument was installed in the gallery, and while much of the Möller organ was retained and reused, several new stops were added to expand its musical resources. A handsome drawknob console was placed in the gallery, which made playing the instrument very much easier. The Peragallo organ was a distinct improvement over the limited resources of the Möller organ, and it gave a good account of itself in leading the many different types of services normally held in the cathedral. The mechanical components reused from the Möller instrument were showing early signs of exhaustion in 2012 as the pneumatic leather membranes that moved the valves began to dry out and fail. The instrument’s deteriorating condition caused The Rev. Fr. Peter Lenox to invite the A. Thompson-Allen Company to conduct a thorough examination of the organ’s condition and a comprehensive three-phased plan was formed to address the instrument’s needs. A contract was signed with the A. Thompson-Allen Company of New Haven for a the first two phases addressing the mechanical stabilization and tonal enhancement that would assure the long term reliability and musical utility of the Hiendlmayr Memorial organ in the coming decades. The Möller mechanical components that had been retained in the 2003 rebuilding of the organ were fully restored in 2013. New pneumatic leather membranes and valves were installed throughout the organ’s chassis and all of the wind-pressure regulators were completely rebuilt with new hinges and corner gussets. The swell boxes of the organ were improved by refitting and thickening the shutters, thereby increasing the range of expression. Relocating a particularly noisy blower to the space in the tower behind the organ and furnishing it with a new static regulator cut down much of the objectionable wind turbulence that had plagued the instrument. While the musical resources of the organ remained much as before, the overall reliability of the mechanism and the expressive capabilities of the organ were much improved. The second phase of improvements began in early 2014. Virtually all of the organ’s pipes were removed from the instrument and taken to the New Haven shops of the Thompson-Allen firm. The pipes were washed clean and repaired, furnished with new tuning sleeves for better tuning stability, and regulated for correct speech. All of the stops were revoiced to enhance their tonal qualities, and a number of new stops replaced existing sets to improve the overall blend and musical effectiveness of the instrument. One of the most dramatic improvements was the increased wind pressure and revoicing of the Pedal chorus reed pipes, which resulted in noticeably improved speech. A new octave of full-length 32-foot pipes replaced the 1979 half-length set provided by Möller, completing the revision of this important stop. The Pedal reed now impart a thrilling climax to the full organ, providing a majestic sound that is found in many of the great cathedrals of the world. Consultant for the project was The Rev. Fr. Peter Lenox, rector of the cathedral, and an organist who has travelled extensively and brought his experience to bear upon the final results of the rebuilding. Fr. Lenox and Nicholas Thompson-Allen (tonal director for the A. Thompson-Allen Company) were responsible for the final design of the instrument. It is expected that the Alma Schenk Hiendlmayr Memorial Organ will serve the needs of the Cathedral Church of St. Augustine for many years to come.